If you know nothing about old home renovations, surely HGTV has taught you one thing, that there are always surprises lurking behind the walls. Luckily, we got a lot of those out of the way early. Well we’d been building up to get a lot of drywall work done throughout the house. Filling in some gaps of where we took down some walls, filling some holes, replacing some shotty work and so on. A week ago, I woke up, took my normal shower then went downstairs to walk Sophia. That’s when I saw it. A slow drip of water coming from the ceiling, underneath the upstairs bathroom. Nooooo, how could it be?!?! Well it was. And that’s how our bathroom renovation project came to be. 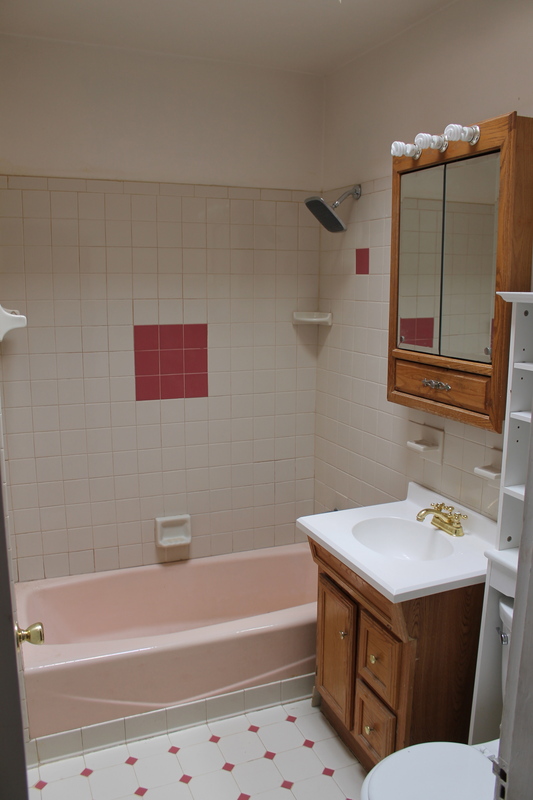 Although we were intending to live with the pink tub and crappy tile for a bit, we knew we couldn’t take a risk of just patching the problem with the bathroom faucet, and risk ruining the new drywall work we were contemplating. The bathroom as we found it when we moved in (save a better shower head and CFL bulbs).